This is about terrible southern accents, SCREW CRUSHER PUNCH, and Mazinger's pilot being relegated to driving a crappy UFO. Click [HERE] to summon SPACE THUNDER. This was a last minute fill in episode since technical difficulties kept us from posting the planned episode. Expect something more robust soon. Grendizer, Goldrake or Goldorak was the first super robot anime to be transmitted in europe back in 1979. I remember it caused havoc, and parliamentary questions were asked in Italian parliament regarding the violence it contained. It also gave way to a vast range of merchandise varying in quality but all of which are still highly sought after in France and Italy. This explains why Grendizer, while not being a milestone hit like Mazinger Z remains the most popular up to this day in certain countries, especially in europe and I would reckon that from all the classic anime, it commands one of the highest licencing prices. The demand for grendizer stuff remains very high, I'm sure the SOC GX-04 remains Bandai's best seller in its famous line of super robot toys. Watching the episodes again today gives me a nostalgic feeling, this robot had replaced Superman, Batman and Popeye as my all time hero as a kid and for many years to follow. Its success, though never matched, gave way to an enormous wave of classic anime to be aired on Italian TV, and living in Malta, 60 miles away from the boot, I had a feast of all the super robots and sports anime. One particular italian website lists most of the anime shows we saw at the time and its counting more than 500 different ones already. I don't blame you for not liking it. It does have a lot of cliche's but this has to be one of the coolest classic super robots. The design is magnificent, it is the most beautiful super robot ever, the choice of weapons revolutionary at the time. It is all the spirit of Go Nagai, funny, classy, cheesy and violent. But nonetheless a masterpiece. I can think of only two super robots which rivalled Grendizer's popularity on this side of the Atlantic during the early eighties, Jeeg and Daltanious, while shows like Getter Robot, much appreciated in The USA never quite took off here in terms of popularity. The big five anime shows in Italy have always been Grendizer, Mazinger, Great Mazinger, Daltanious and Jeeg. 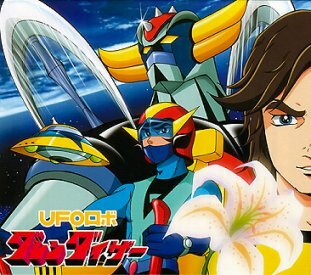 Others like Voltes V, Yatterman, Tiger Mask, Ashita no Joe, Astro Boy and Versailles no Bara come close. I have seen episodes of the english dubbed version aired in the USA as force 5. And yes they are ridiculous. The problem with US reviewers when dealing with Go Nagai is they like Voltron too much. When Voltron appeared on our TV's here, the hype for Super Robots was gone. Many preferred the sports hero anime shows. Anyway, Grendizer is and will always be my favorite, all i can say is GOLDORAK....GOOOOOO !!! P.S. By the way, who is called Lance ? A certain Lance Armstrong perhaps ? Thanks for the snapshot of Anime in Italia, it's interesting to learn about what worked and did not work in other countries. I actually did not like Voltron, I tried to catch Tranzor Z ( Mazinger) early in the morning when I could. I did like the Dairugger/ Vehicle Team Voltron but they hardly showed it at all as programers concluded that the Lion team was more popular. Hey, I like Grendizer, even though it's kind of reheated Mazinger. I really like the Duke Fleed/Koji Kabuto dynamic. Their rivalry/friendship thing is a lot of fun. Good to know exactly why Grendizer is so loved in Europe! Thanks! I really, really like the show, but one of you keeps breathing into the mike. I'm sorry. Giant robots make me hot and heavy. Yeah, that would be Andrew breathing into the mic. Sorry. This was recorded over a year ago and we've gotten a lot better since then. We just have an emergency stock in case something goes wrong with the main show we were trying to release, and this time I had to dip into it! A real show is coming in the next couple of days, as soon as I can get my multitrack going again. I like the random of booze behind it. Haha, that's great! When I was a kid in the 80's I definitely remember having Transformers brand shampoo where the bottle was shaped like Optimus Prime!